If you are replacing your existing door with a new one, you will no doubt have to replace several parts, but they may be only screws for the hinges or worn-out rollers. You will almost certainly have to change the spring system since their size and strength are based on the weight of the door. The weight of a wood door, an aluminum door, and a steel door differ greatly. 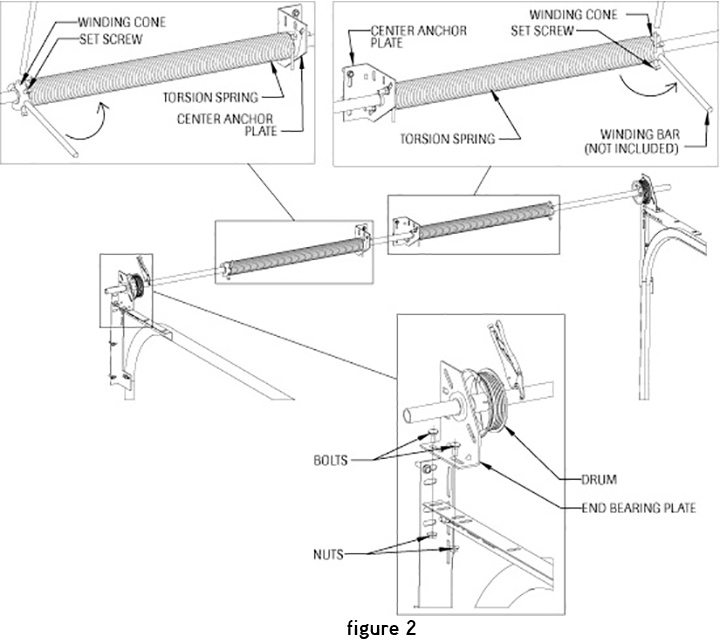 It is important to understand that the springs used in opening and closing a garage door support the entire weight of the garage door. This means that there is extreme tension in these springs and that any sudden and uncontrolled release of these springs is dangerous and could cause serious injuries. The first and most important step in the removal of a garage door is the release of the tension in the springs. For extension spring hardware, the tension in the springs disappears almost completely as soon as the door is completely opened. You can now release the cables and take off the springs without any trouble or danger. Then, take off the clamps or the locking pliers and slowly close the door. WARNING! Do not execute this step alone. Remember: a garage door which is not linked to a spring weighs it’s real weight and trying to handle it alone could be dangerous. We suggest you place a wood block under the door before closing it to prevent getting your fingers caught. You can now undo the panels of your door starting by the top panel. First of all, lock the door in the CLOSED position. You can either use the locks installed on the door or use clamps or locking pliers as shown in Figure 1. Then block the spring shaft with locking pliers leaning against the wall (header) as shown in Figures 2 and 22. Then, insert one of the winding bars into one of the holes of the winding cone, HOLD IT FIRMLY TOWARDS THE TOP, and unscrew the set screws which are found there. WARNING! 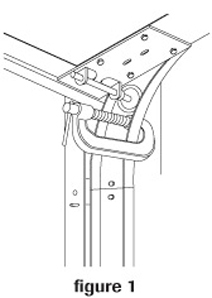 As soon as these screws are loosened, all the tension in the spring will go to the winding bar; it is really important to keep this bar very tight to avoid a sudden release of the spring. Let the spring slowly unwind towards you and then insert the other winding bar in the hole at the top. Take out the bottom one only when the top one is well-inserted and held firmly in your hand. Continue this procedure until there is no tension at all left in the spring. Repeat the same steps on the second spring, if need be. Release the cables and then take off the clamps or locking pliers. You can now undo the panels of your door starting by the top one.